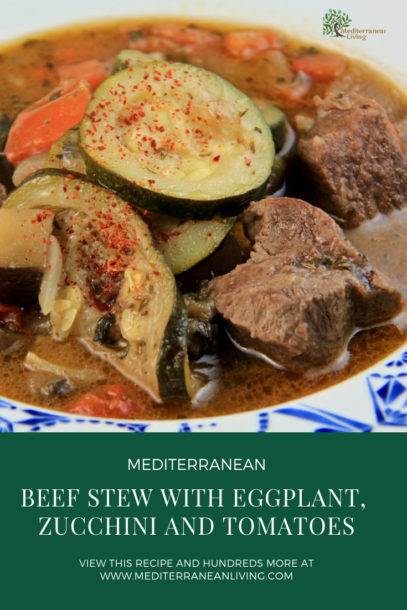 This traditional Cretan dish is a Mediterranean Diet favorite that will warm you and fulfill you. Rich enough to serve as an entree for a Sunday dinner, yet, quick and simple enough to enjoy any night of the week. 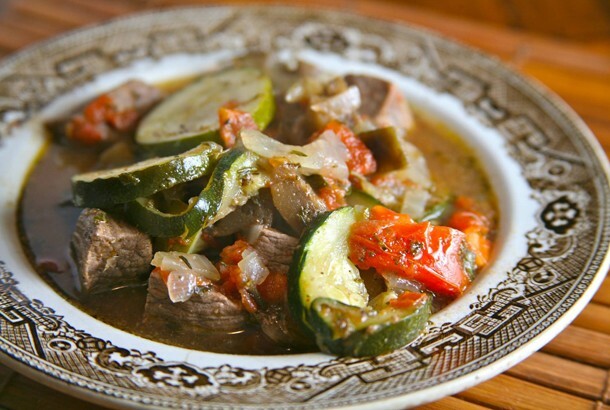 Serve with crusty sourdough bread for sopping up the delicious sauce from your bowl. I also recommend the Greek Salad or Cucumber-Tomato Salad with Feta and Fresh Mint to go with this meal. In a pot, heat half of the oil and brown the meat. Cover the meat with water and simmer. In another pot, add the rest of the oil and saute onions and vegetables until soft (about 10 minutes). Add the tomatoes and mix everything together with the meat. Add the thyme, sage and mint. Add salt and pepper to taste. Bring to a boil and then lower heat. Simmer for 45 minutes.